I wrote this post five years and one month ago. A post about things on my mind that I wanted to acknowledge but didn’t want all out there, in the inter webs. Although five years have gone by, some of those same worries remain. There is at least one difference. My mindset has shifted, and I’m beginning to acknowledge my biblical upbringing that reminded me to let worries go to a higher power. I’m not saying I actually do that, even successfully, but my awareness towards letting go is increased. We all suffer and struggle, how can we be free? 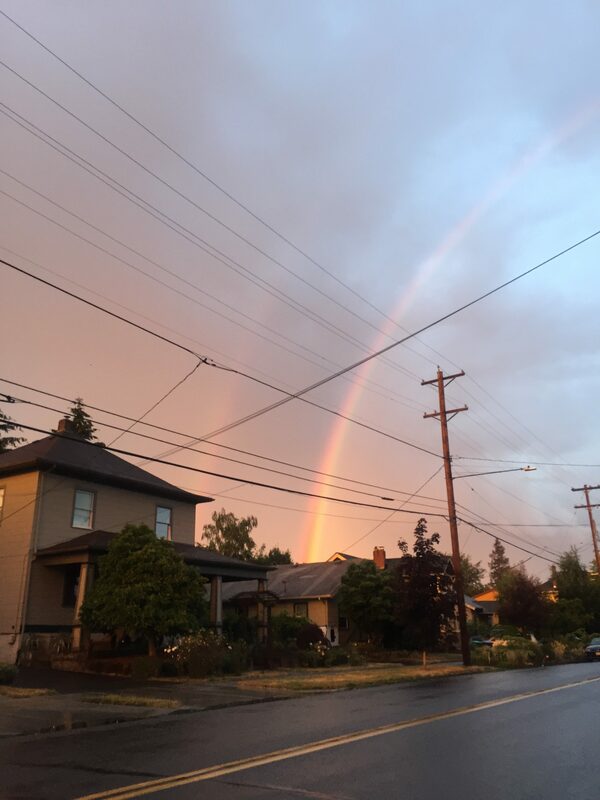 I saw this double rainbow a few months ago on my way home from an evening event. Few things describe hope better than a rainbow. In the last five years, I’ve been introduced to two ways of thinking about events. In my oil business, we talk a lot about personal growth and development. I can see clearly how a shift in thinking is needed and how it affects my growth in this (or any) business. Although I’m not always sure what to do in a minute-by-minute assessment, I am paying attention and attuning my attention to these different ways of thinking. One new way of thinking is Byron Katie’s “The Work.” In her work, she invites us to just ask, “Is it true?” Any thought that comes to mind, “Is it true?” Through the work of inquiry, she guides, you can relieve yourself of unnecessary suffering. Suffering that we have ultimately brought on ourselves. One way to free our thinking, specifically over money, is to consider money as energy. Money is simply a transfer of energy. So, how are we feeling towards that energy, at its base. Marianne Williamson’s The Divine Law of Compensation is oft references to help guide one to new thinking about money. In the intro, she proclaims she is a student of, for more than 35 years, A Course in Miracles. A Course in Miracles is the second thing that’s come my way in the last five years. The words that emirate from this text ring true to me. It’s like veils have been revealed from the Catholic/Christian teachings I was given all throughout. It feels as if things I’ve known in my heart are being stated in another way, validating questions I’ve had. The message I want to impart today though is the reinforcement of not worrying. The reminder that the only true thing we can know is love, and nothing else is real. The reminder that when fear creeps up, it is the ego getting in the way. So, let fear go, let the ego go, do not worry. Do your work, trust in God, and be on your way. It will work out. The calls to have faith that I never understood from 3rd grade on now (kind of) make sense to me. I’m still working on all this letting go and to have faith, but it’s as if I can feel the reasoning now. Something I couldn’t have said five years ago when all those worries crossed my mind.